From a rather young age Derek Bruno believed in diversification. 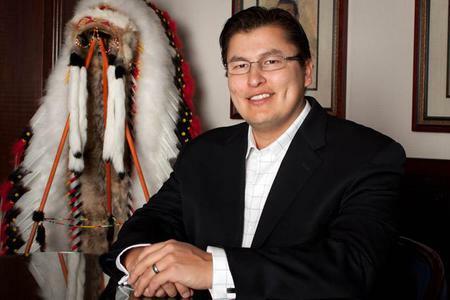 By his early 20s, Bruno, a member of Alberta’s Samson Cree Nation, already owned a pair of businesses. With the help of his then teenage brother he was running a bottled water company as well as a convenience store. So it wasn’t a big surprise that Bruno was asked to be on the inaugural Cando youth panel which was held in 2005 in Sault Ste. Marie, Ont. Cando is the national organization that promotes Indigenous economic development. “At the time there wasn’t a lot of Indigenous entrepreneurs in Canada,” Bruno said of his gig as a Cando youth panelist. Bruno’s career has taken a couple of twists since then. For example, he moved to Winnipeg and got into banking for a bit. And he also served two terms (2005-08 and 2011-14) as a councillor for the Samson Cree Nation. Plus he also pursued his MBA in Community Economic Development from Cape Breton University. Bruno said Cando has provided him with inspiration throughout his career, including his decision to pursue his MBA. “It’s been quite a huge influence on my own journey,” he said of Cando. Now at age 40 Bruno once again finds himself as a multi-dimensional entrepreneur. He currently owns six different businesses. “You can still get some very hairy days but you get used to it,” Bruno said of the fact he’s in charge of a half dozen different ventures. Bruno’s companies include a management consulting business, a publishing firm and a general construction company, which specializes in steel fabrication, thermal insulation services and trucking. Bruno also purchased a Jani-King cleaning franchise along with his parents, primarily so the couple, now in their 70s, can have some residual income. Bruno’s mother Sophie handles quality control for the business while his father Victor drives staff to various clients. Other current passions for Bruno are renewable energy and permaculture. To this end he has launched a pair of companies – SevGen Renewables Ltd. and WIN EcoSciences Inc. – that provide innovative programs aiming to help Indigenous communities.